The American Time Use Survey (ATUS) provides extensive information on how Americans spend their time, and has been of particular interest to economists, sociologists, and other researchers. Researchers have sought to study commuting behavior using the ATUS, but its stock time use measures do not measure commuting satisfactorily. This package provides Stata code to implement the previously described trip tour methodology, constructing an appropriate measure of commuting from ATUS activity-level files. This software was developed to implement a methodology to calculate commuting time as described in Kimbrough . The described methodology corrects a significant limitation of the American Time Use Survey (ATUS). While the ATUS provides information on every activity a respondent performed in a 24-hour period, it lacks an appropriate measure of commuting. This implementation makes possible analysis of commuting and its relationship to other uses of time. As examples of its use, Kimbrough  applies this software to examine the gender gap in American commuting behavior, while Stone and Schneider  use this methodology to analyze wellbeing during commutes. The ATUS contains a stock measure of “travel related to work,” which many researchers have interpreted as commuting. Kimbrough  describes the ways in which this measure does not fully measure commuting, and proposes this alternate methodology in its place. The alternative “trip chaining” methodology described in Kimbrough  calculates commuting time for a worker as the total travel time between home and work, provided that no stop of more than 30 minutes is made along the way. This software performs this calculation using hierarchical ATUS data from the American Time Use Survey Extract Builder (ATUS-X). The ATUS-X dataset has the advantage over raw ATUS datasets of containing all available years of data in a single file, with variables harmonized and integrated across years. This software is implemented in Stata. It takes as input hierarchical data extracts from ATUS-X, which provide information on all activities on a respondent’s diary day. This software has several component modules, executed in order by atus_commuting_calculation.do. 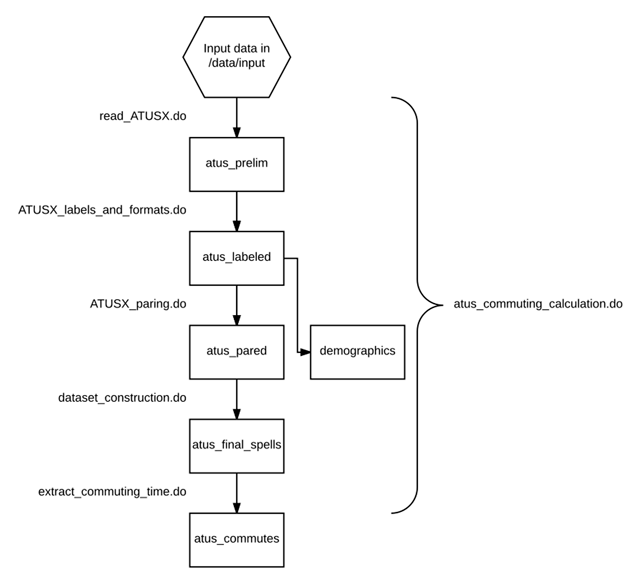 An overview of the datasets produced in the /data/output directory is shown in Figure 1. Software components and data files produced. First, the read_ATUSX.do program reads in ATUS-X input data. This program is an edited version of the file provided by ATUS-X for reading data into Stata. The comments provide guidance on editing a file for a custom data extract to obtain a correctly formatted, rectangular Stata dataset. Next, a lightly edited version of the labeling code from ATUS-X, ATUSX_labels_and_formats.do, attaches variable and value labels to the data, producing a labeled dataset. ATUSX_paring.do then limits the data to suitable respondents, as described in Kimbrough . The commuting calculations are performed by dataset_construction.do, which produces an activity-level dataset with various flags and calculated commuting times attached. Finally, extract_commuting_time.do generates a dataset with one observation per respondent. The code has been tested extensively using the provided input file. If the package runs correctly using the current input file, it produces a an atus_commutes.dta file containing commuting time for 40,231 individuals. Users with feedback or support requests may submit Github Issues or contact the author via email through Github. Stata software is available for Windows, OS X, and Linux. This code was tested on Stata version 13.0 and 15.0. It should work on earlier versions as well, but this has not been tested. The input dataset is about 400 MB in size, and must be unzipped before use. Sufficient storage space must be available for the input data and intermediate files as well as output files. A utility must be used to unzip the provided input dataset. This code can be extended to calculate additional measures. In particular, the assumption of a 30 minute allowed stop time can be relaxed. Additionally, it includes code to separate commuting in each direction, as well as the number of stops along the way in each direction. The provided data contain all ATUS respondents from 2003 through 2015. As additional years of data are added, new data can be incorporated. Hofferth, S, Flood, S M and Sobek, M (2013). American Time Use Survey Data Extract System: Version 2.4 [Machine-readable database] In: Minneapolis, Minnesota: Maryland Population Research Center, University of Maryland, College Park, Maryland, and Minnesota Population Center, University of Minnesota.